Just some miscellaneous stuff that has been going on as well as a fun activity I have planned do to for myself! First, the insurance company that our funeral home uses, went into the funeral home a little while ago and did a nice video of the funeral home with Shawn narrating. It turned out nice. 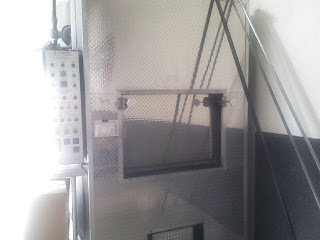 Another "happening" is our crematory got a new chamber installed. 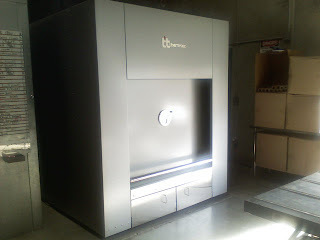 It is rated to cremate up to 800 pounds!! The crazy thing is, they actually will need to be be able accommodate 800 pounds. This is the old "standard size" chamber. This is the new chamber. See how much bigger it is?!!! And finally, click here to see what I plan to do some time in June!!! VERA!!! Have you lost your mind??? LOL I about had a heart-attack when I saw your next adventure. Sheesh! You're alot braver than I am. Have fun and be safe. That is awesome! I have always wanted to try skydiving! I bet it will be a blast! Be sure to wear your "depends" for the adventure! But I have to say, if I was forced to choose between skydiving or bunjee jumping I would choose skydiving! Take pictures and if you need someone to drive you home I am your girl!